The main intention was a stop over to see friends and ride some of the excellent single track that we have come to know and love. 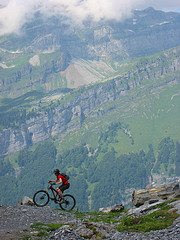 The ride that we will focus on after 4 days of getting hooked is the ride from Morzine to St Jean de Sixt. Carl and Sian wanted to try out some new trails over in the valley so who were we to decline an adventure on the bike? 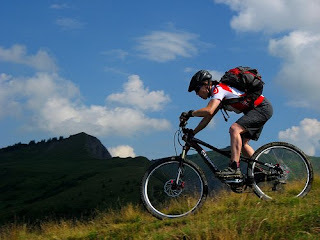 First it was up le pleney and then having been sold short on the lift, we along with Catherine were tasked with riding to the top of the Col de Joux Plane while the others took the lift! We should have known then that the day would turn into an Alpine Epic! A quick hot chocolate at the top of the Joux Plan was a welcomed break except for H who decided to fall asleep in the middle of Gareth's story and end up wearing most of the hot chocolate! Having been licked clean by the resident Alsatian it was time to get on the bikes and cross the cow pat field to the start of the first descent! Worried faces showed what we were all thinking! Where the hell is the trail?! It looked and felt like it dropped off the edge of the mountain! Many kilometers of descent later we arrived in Samoens for lunch! Then it was a ride up the valley to St Jean de Sixt. Anticpation of a big climb filled the air and it wasn't long before the fear became reality! Altitude, lung busting climbs were rewarded with fantastic views and gymnastic opportunities! Recovery over it was time to venture onto the singletrack trail to the valley floor. The trail was full of amazing views and vast storm channels that run low during the summer. It wasn't long before we were in the cafe waiting for our lift home discussing the days events over a well earned drink.